So I just got home from working commercial HVAC is Charlotte for ColonialWebb Contractors during the week of the 15 though the 21 and I find this post. The whole time I was down there I'm asking everyone where to get a fender for a 300D. I even put an ad on craigslist in Charlotte. Now that I'm 168 miles away, do you have a good to excellent right front fender? I have creme astral silver, and others too... the silver one is the frst one I wanna tear down that is in good shape. the creme is too rusty I bet. I keep getting hassled like that myself. This latest time it was in retaliation by the grand mother of a little thief. I got a call from my work that a kid jumped the fence into my yard, stole something, jumped the fence again, ran across the street into an open garage, and then closed the garage door quickly. Later in the week I saw the grandfather so I told him what the neighbor witnessed and that I hoped it was a ball or something and not thievery(it was tools!). He thanked me and when he told his wife she called the city of reno on me. So I have to make sure every car on the street is moved every 48 hours. I take pictures with current newspapers in the pictures with the cars at different locations about town. I cannot have more than 2 unregged vehicles on the property. Now I've got 16 more in the backyard but I have a 6 foot fence all the way around. They try to get into my yard but I chain the front driveway gate closed and posted no trespassing signs in my front fence. The city knows they are there but cannot get to the back to see what I got! I also have to make sure and pick up any garbage thrown by pedestrians and pull weeds asap so to not give them any reason to get me. 2 weeks ago I parked a car in front of their house so I could unload a truck full of firewood. 3 little girls were sitting in the front yelling "you can't park there!" over and over again to me which I ignored. I fact is I sure can! it's a public street and I wasn't blocking their drive way. I decided to leave the car there for 2 hours instead of 15 minutes for that. I could park my cars in front of their house all the time, but I don't. I thought it interesting how they forgot my fixing the old man's truck twice, shoveling their snow, helping the old lady get across the street during a flash flood, etc. I have a 82 300sd, would be interested in a spare IP. Can you give me a price including shipping to 32225. Devilish-I got you beat. My wife (an RN) once did CPR and keep my neighboor alive when she had a suden seizure/stroke. Months later after a full recovery they called the city on us for unregistered car. 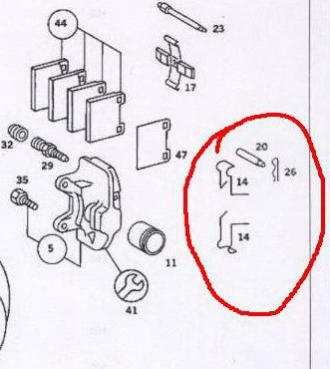 I am looking for some small brake parts that the local dealer can't or won't get. I need #14 in the attached picture and if possable #20 and 26. Oh yea these go on the Bendix calipers. Next seizure/stroke tell her she'll have to wait; you're on your way getting your car registered and you know how important it is to her. To paraphrase someone on this forum: The average person is an idiot. 283K Miles and ticking, Baby. brake hardware should be available thru almost any good parts house. If the dealership is too lazy to look them up, they dont deserve your money anyways. Need a driver's side mirror glass for a w123.